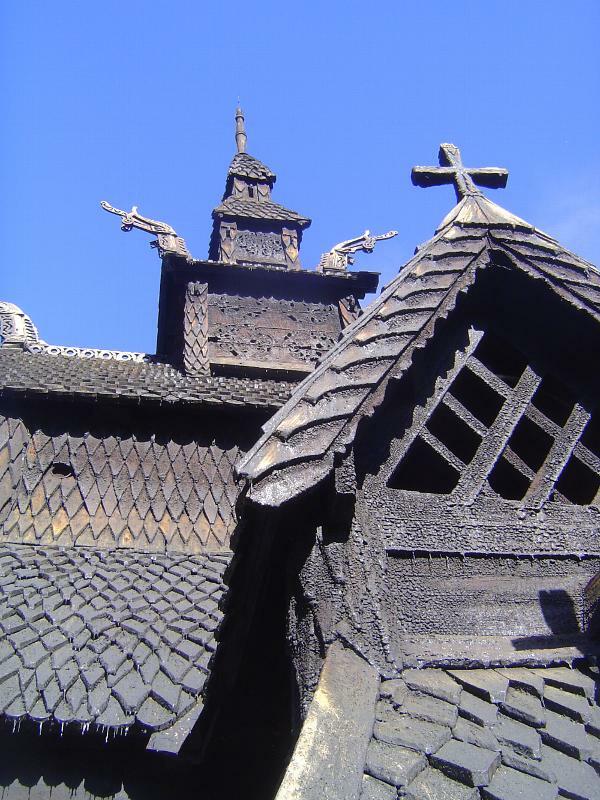 About a thousand stavkirker or stave churches were built in Norway between the adoption of Christianity, say about the year 1000, and 1350, when the Black Plague decimated the country. During the two centuries while the population recovered, the churches got little maintenance-- an Oslo bishop in the 1590s wrote that church after church was "completely deserted" or "completely decayed"--and by 1650 only 170 of the thousand remained. Many of the survivors were in the following centuries demolished as old-fashioned, by 1900 there were only 70 left. Many had been modernized almost past recognition. Eight were purchased by the Society for the Preservation of Norwegian Ancient Monuments, created in 1844 by the painter J.S. Dahl and others, especially Joachim Frich. Two of the eight are shown here. 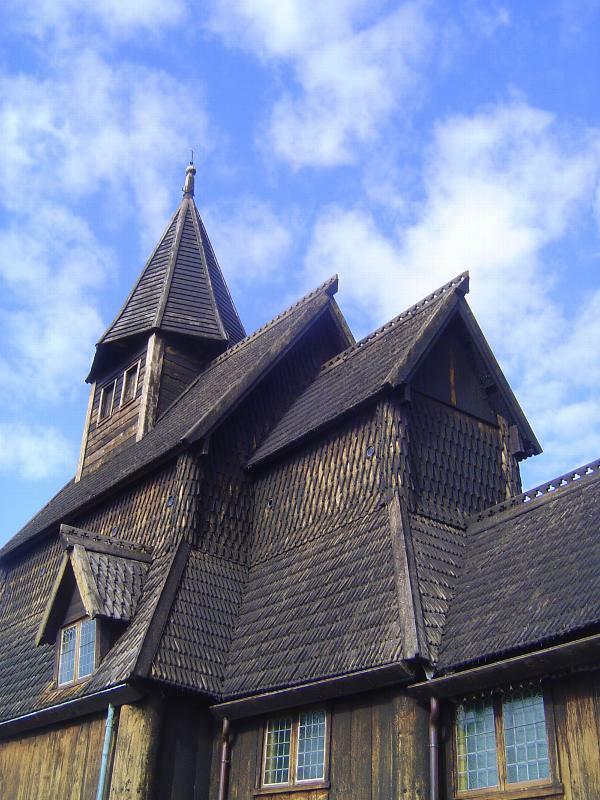 The first is considered the stave church par excellence; the other, though slightly modernized, is a bit older. You can see why Dahl got excited. A Bergen native, he moved early in his adult life to Dresden, then returned to Norway in his mid-30s and "discovered" these churches at a time when Norwegians were busily replacing them. 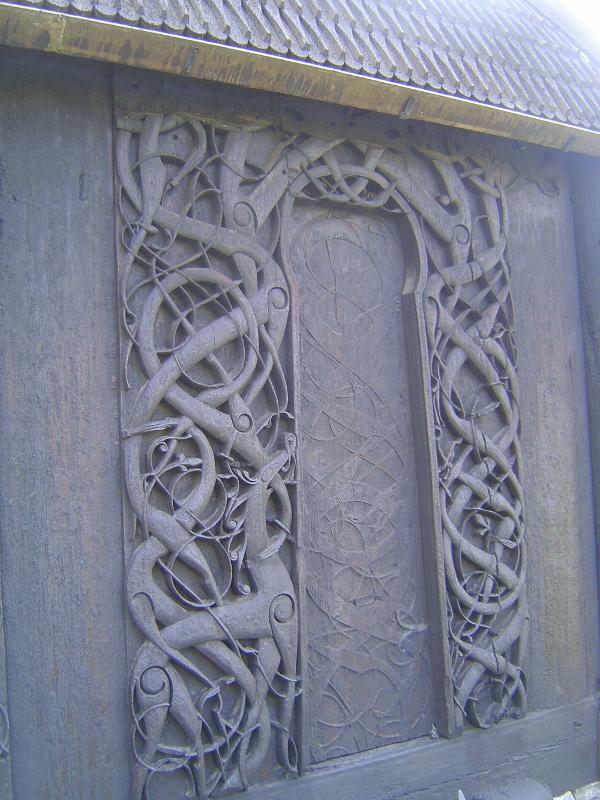 He had no luck in persuading the people of Vang not to destroy their own stave church, but he persuaded Friederich Wilhelm IV to buy it. 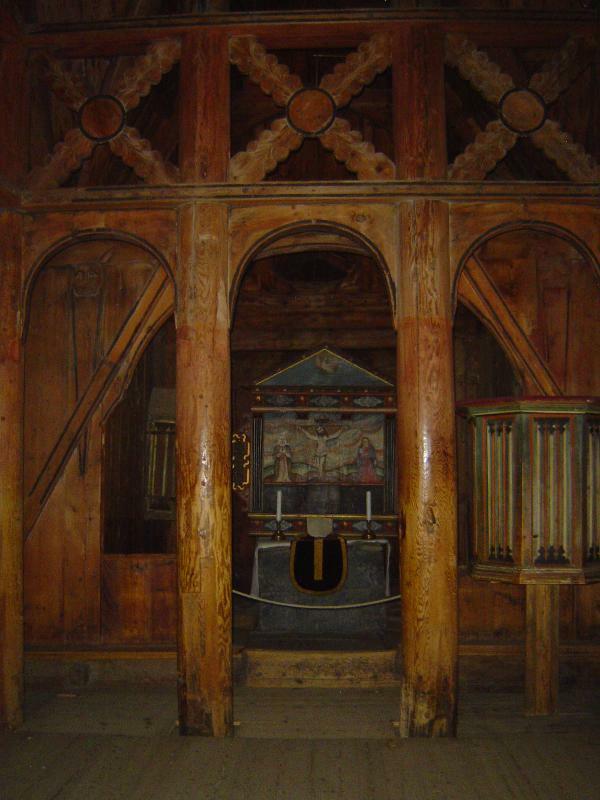 The church stands today where the Prussian king reassembled it in Bruckenberg, now Karpacz, Poland. Dahl also drew what he saw, and the results appeared in three volumes in 1836-7 under the title Denkmale einer sehr ausgebildeten Holzbaukunst... in den innern Landschaften Norwegens. That's all by the by. 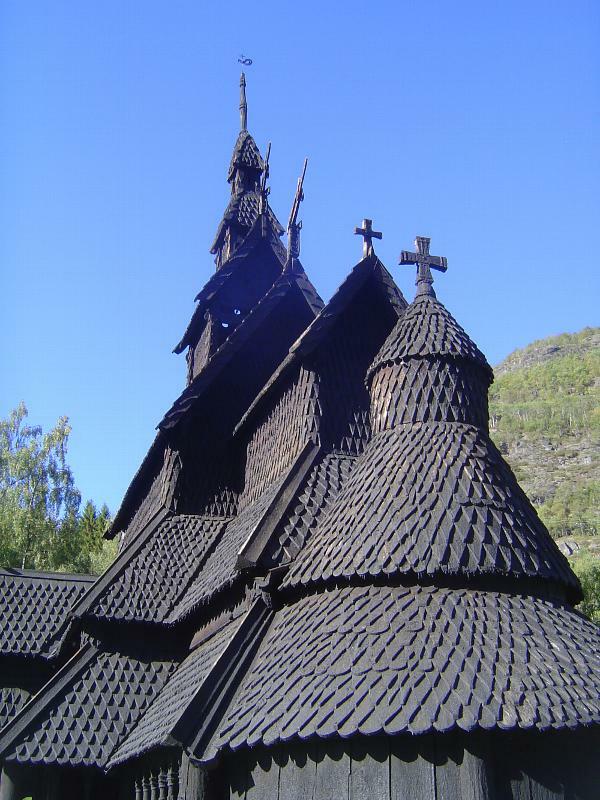 Here's the Borgund church, the "stave church of stave churches," acquired in 1877 by Dahl's Society, which removed post-Reformation alterations. The church was restored again in 1970. The material is pine, coated with tar as a preservative. 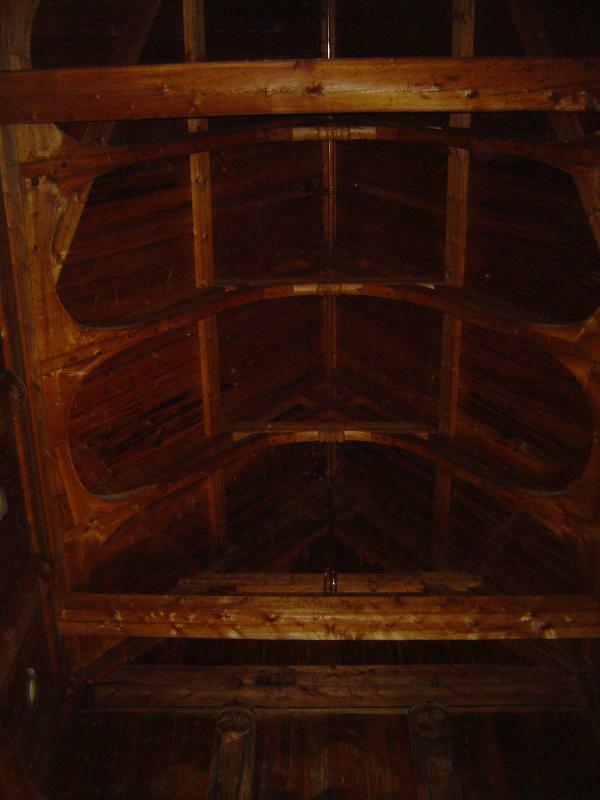 The original roof was of boards, replaced in the early 1300s by reptilian shakes. 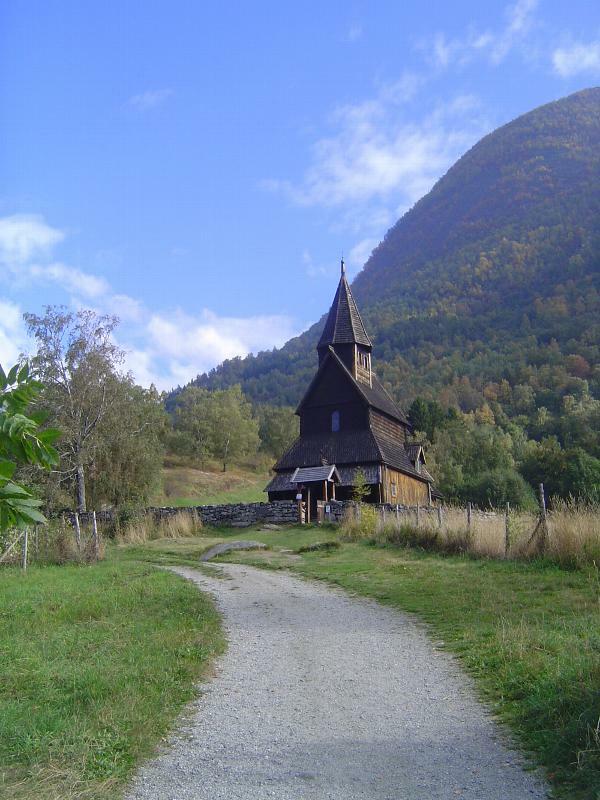 The church is about 100 miles northeast of Bergen and ten miles south of the eastern end of the Sognefjord. 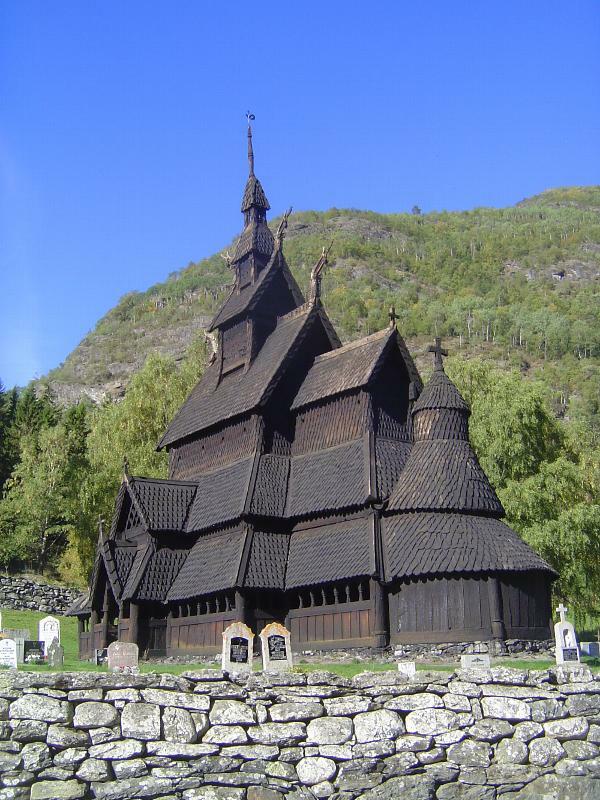 Built roughly between 1150 and 1200, it has the stave church's characteristic cascading or tiered roofs arrayed from the vane and belfrey to the nave roof, aisle roof, and external gallery roof. Both the belfrey and nave roofs have dragon-head gables. The church has a chancel with its owned tiered roofs and walls, and it has a curved apse with a turret, turret wall, apse roof, apse wall, and gallery roof and wall. The structure, in other words, is tiered both vertically and horizontally. The floorplan is familiar from churches throughout Europe, but the tiered profile is uncannily like that of many Hindu temples, for example those at Khajuraho. Go figure: speculation doesn't cost a lot. 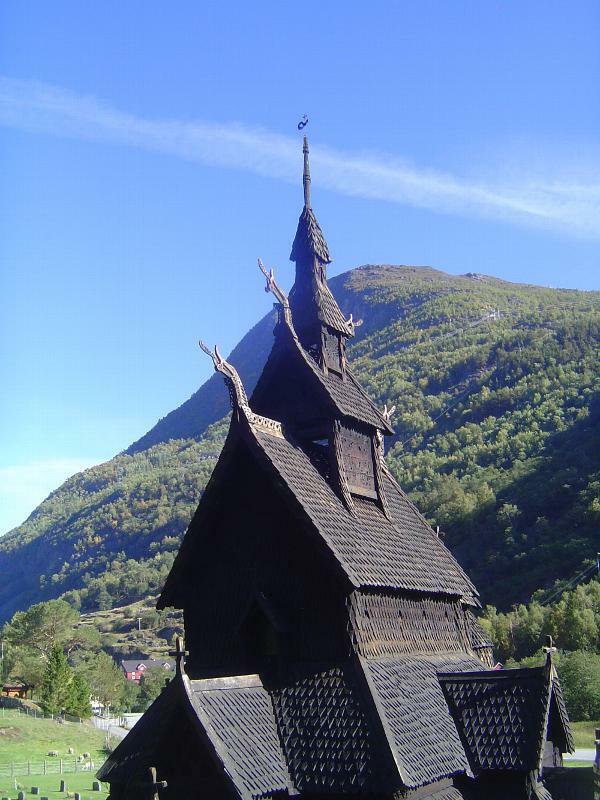 The dragon-head gable heads may be derived from the prow of Viking ships: after all, the men hired to build these churches were probably shipbuilders. Notice the upward curved snout, the flicking tongue, the jaw, eye socket, and tousled mane. The date 1738 is carved into the ridge crest, but parts of the dragon heads are old. Old enough to be original? Who knows? Where the dragon-head ultimately originates is anyone's guess, although it presumably goes back to Norse religion. 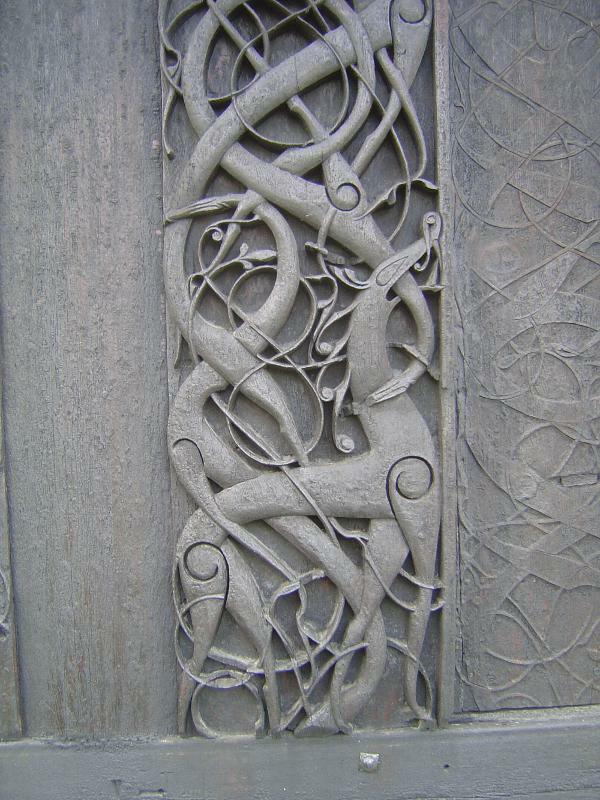 Christianity, after all, came to Norway via Viking expeditions to the British Isles, and the Viking ships that made those journeys already carried the dragon motif. Here's a bit of the external gallery. There are no nails anywhere in the structure. But why the gallery in the first place? 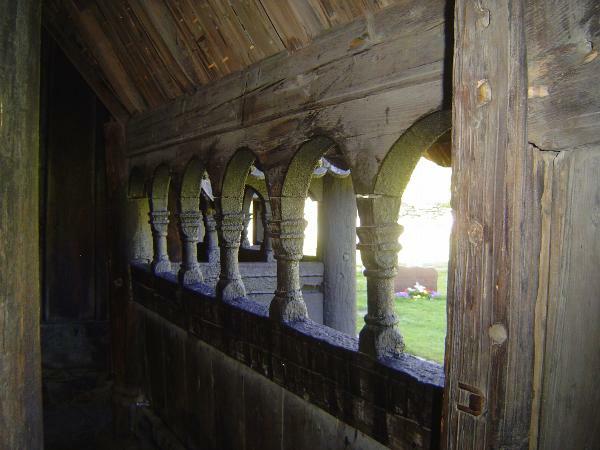 One Norwegian architect, Thomas Thiis-Evensen, points out that "travellers from afar received protection from rain and snow while waiting for the church service, and we know that the unbaptized followed the church service from the galleries through small holes in the walls." There was an psychological element, too. Thiis-Evensen writes, "We know that the Nordic rules for transferrals of land ownership required the purchaser to walk around the boundaries of his newly-acquired fields before his ownership was official. 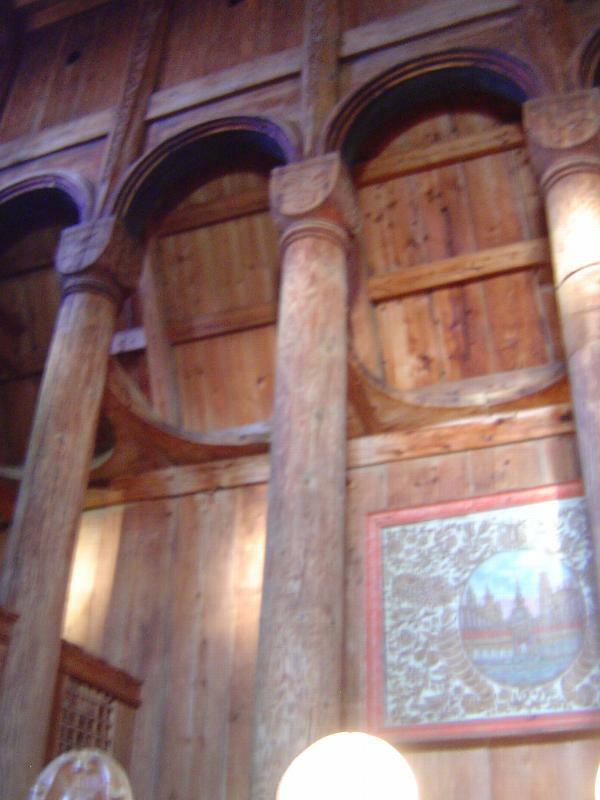 The cloister's ambulatories around the altar of a gothic cathedral provided a similar opportunity for the flow of pilgrims" (see Eva Valebrokk and Thiis-Evensen, Norway's Stave Churches: Architecture, History and Legends, 1995). 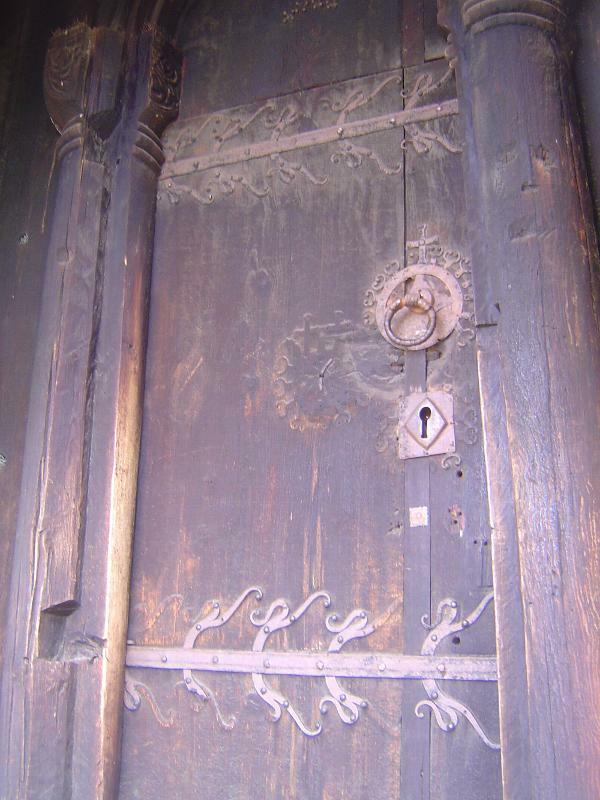 The round-headed door is original, as is the upper strap hinge and the square lock plate. 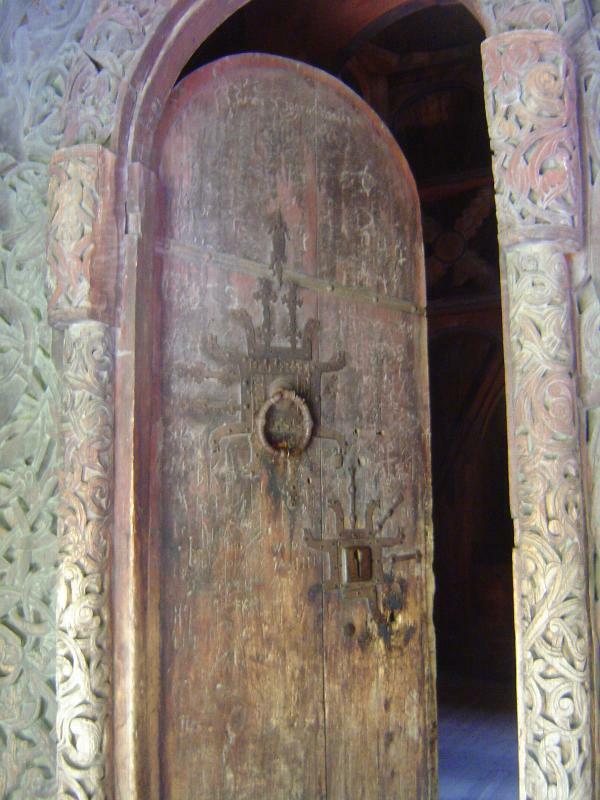 The planks of the door, like all the wood used in the church, were shaped with ax, wedge, and adze. No saws, in other words. But why is the doorway so narrow? Could the builders not manage double doors? Thiis-Evensen explains that the narrow entrance was deliberate. "The sacred was to be approached alone.... At the opening, one is encircled by a richly-carved frenzy of struggling serpents, dragons and lions... The struggle is particularly extreme here at the entrance to the sanctuary, the threshold to salvation." As a symbol of the transition from profane to sacred, the doorway bears comparison to the moonstones of Anuradhapura, in Sri Lanka. Both the pulpit and altarpiece are later additions, the one from 1550, the other from 1654. 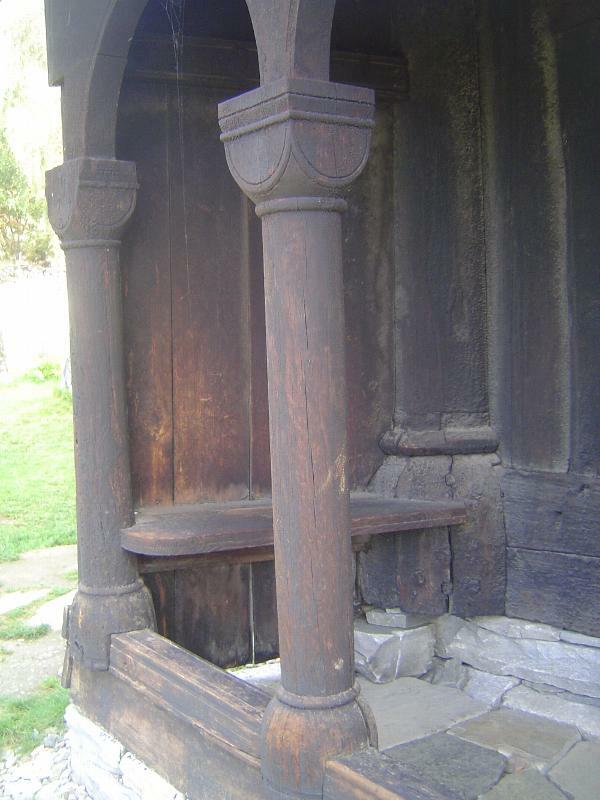 The staves are original, protected from decay at the base by being footed on stone blocks. Roof of chancel and nave. 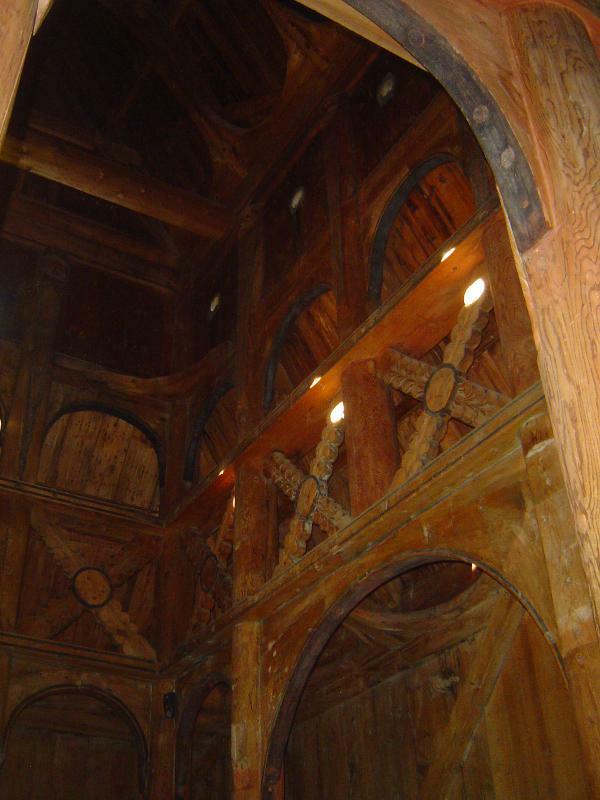 Stave churches were repeatedly tarred for protection from the elements. After a while, the surface becomes deeply alligated. 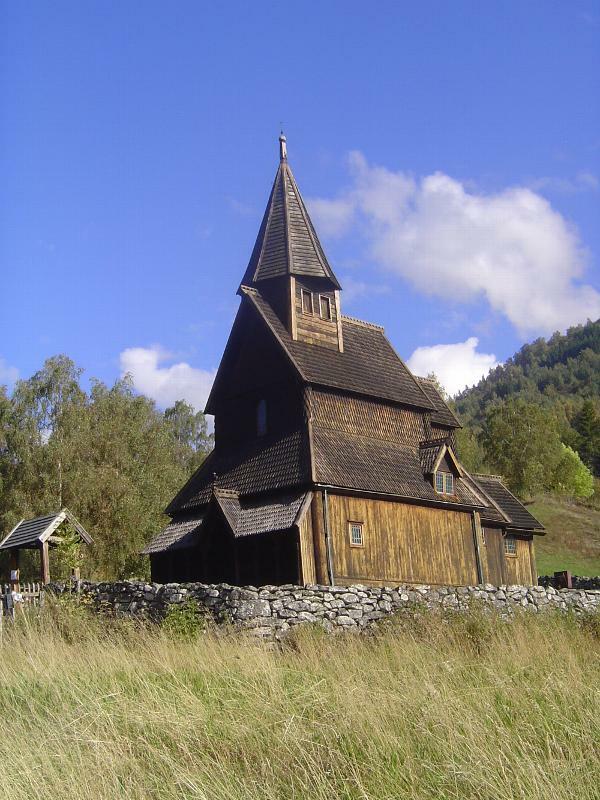 Here's the Urnes stave church, built about 1150 and the oldest surviving stave church, though the steeple is obviously a much later addition. No dragons on the gables, either. The entrance porch is supported by block capitals. The jambs are simpler than those at Borgund, but the hinge straps are special. Ghost images of older hardware can be seen higher up, near the keyhole. On the north side of the church, there's an old doorway framed by two carved jambs. The image appears to show creatures ("Urnes beasts") biting each other, perhaps metaphorically virtue fighting evil. 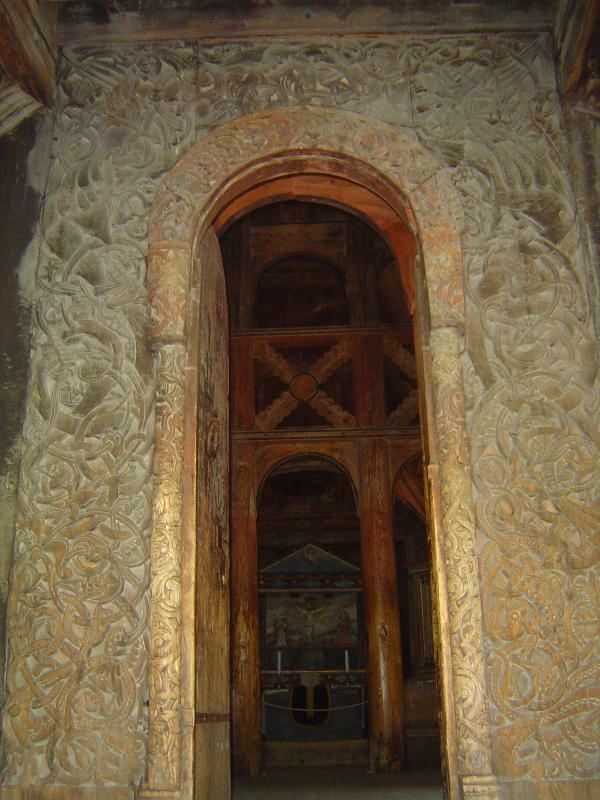 The carvings were done before 1100 and were moved here from another church, now vanished. The wide planks of the wall are fitted together tightly by placing them, one by one from the corners of the buildings until there was room for only one last plank. The edges of the final plank are slightly tapered, as are the edges of the two planks between which it fits. The last plank was then dropped and hammered into place. A wedge, it tightened up all the planks in the wall and helped hold them together without nails. 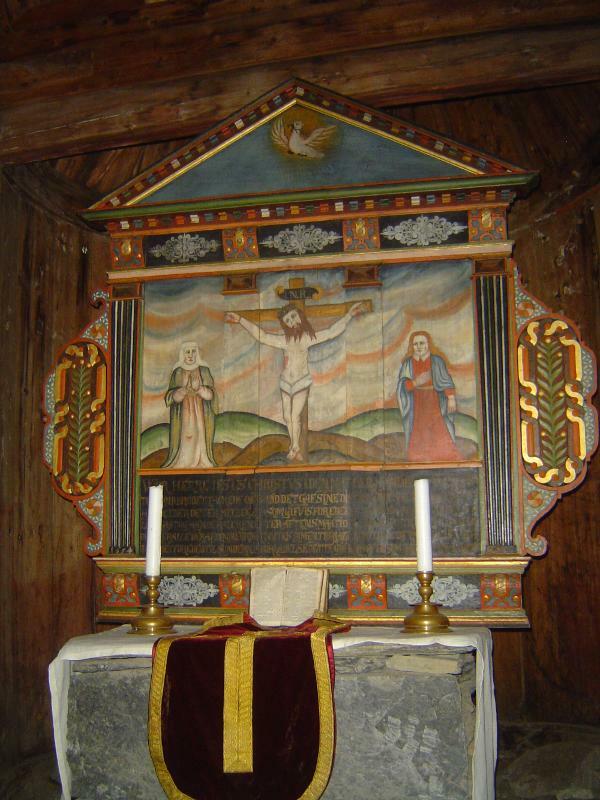 The Society for the Preservation of Ancient Norwegian Monuments bought the Urnes church in 1881, and the church is now on UNESCO's World Heritage List. Photography is forbidden as, for some reason, disrespectful, so you'll have to settle for this unfocused snap. Through the haze you can see the block capitals, along with the L-block arches. 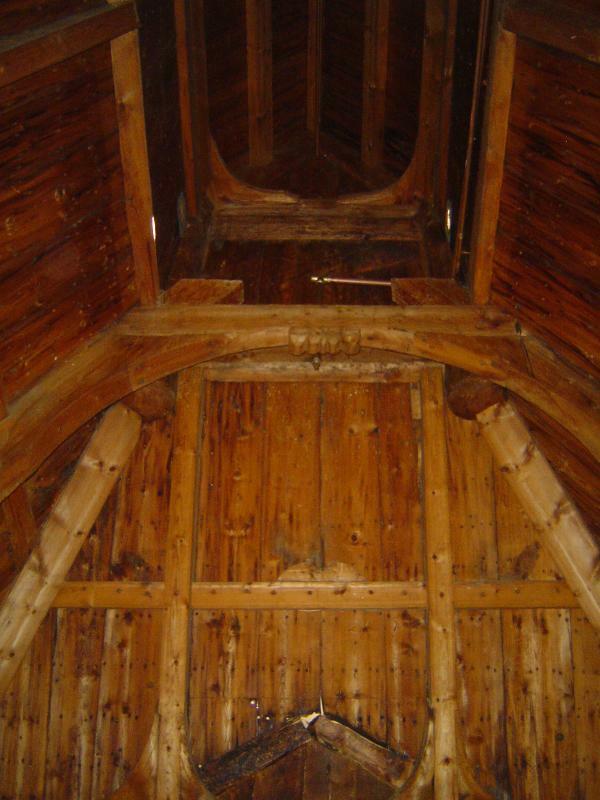 The staves, trimmed to a narrower profile, continue to the roof.